This “diet” food is so hard to take! And with a great blood glucose response to boot! 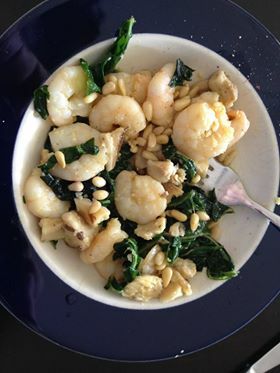 Fresh prawns from the markets with spinach, pine nuts, shiitake mushrooms, butter and garlic. Super high on the vitamins and minerals as well as aminos with the pine nuts and spinach. Prawns are a nice way to get your DHA in as well. which nutrients is YOUR diet missing?